Black tassel Pterosiphonia bipinnata, from Seaweeds of Alaska. The Pterosiphonieae is group of Rhodomelaceae exhibiting bilateral apical development but no primary dorsiventrality (Womersley 2003). Characters Thallus erect (often with a prostrate base) or largely prostrate, branching bilateral with discrete, alternate, terete to compressed, distichous laterals, or flat and elongate with short marginal determinate laterals, or branched with foliose rounded apices. Branches one cell thick with a small-celled cortex, or 2 cells thick and ecorticate, with or without a midrib. Structure. Apical cells dividing transversely to form axial cells, with the subapical cells dividing obliquely to form alternate distichous laterals. Frond apices with a single apical cell or a margin of several to numerous apical cells, each forming polysiphonous systems congenitally fused at their base to the axis, or fused along their whole length to form flat fronds; pericentral cells 4 to numerous, in some genera transversely divided. 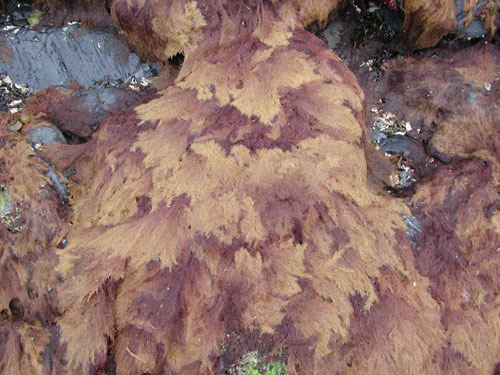 Trichoblasts rare and associated only with sexual reproduction, or frequent on the thallus surface or margin. Cells generally uninucleate. Reproduction: Gametophytes usually dioecious. Procarps with a 4-celled carpogonial branch and sterile cells, surrounded by a pericarp prior to fertilization; carposporophyte with a basal fusion cell and branched gonimoblast with terminal carposporangia. Cystocarps usually ovoid, pericarp ecorticate or lightly corticate. Spermatangial organs replacing trichoblasts or branches thereof. Tetrasporangia in terete lateral branches or in stichidia associated with trichoblast tufts on the thallus margin or surface, spirally arranged and single per segment.